Romanian-born Jewish Holocaust survivor, writer, professor, activist, and thinker. Mankind must remember that peace is not God's gift to his creatures, it is our gift to each other. 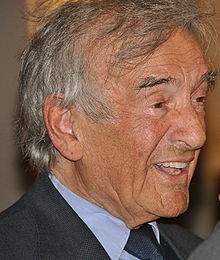 Eliezer "Elie" Wiesel (September 30, 1928 – July 2, 2016) was a Romanian-born American Jewish writer, professor, political activist, Nobel Laureate, and Holocaust survivor. He authored 57 books, written mostly in French and English, including Night, a work based on his experiences as a prisoner in the Auschwitz and Buchenwald concentration camps. I swore never to be silent whenever and wherever human beings endure suffering and humiliation. We must always take sides. Neutrality helps the oppressor, never the victim. I rarely speak about God. To God yes. I protest against Him. I shout at Him. But open discourse about the qualities of God, about the problems that God imposes, theodicy, no. And yet He is there, in silence, in filigree. That place, Mr. President, is not your place. Your place is with the victims of the SS. Comments regarding US President Ronald Reagan's proposed visit to a Bitburg cemetery with then German President Helmut Kohl, on receiving the Congressional Gold Medal from Reagan (4/1/1985). In an interview with Carol Rittner and Sandra Meyers in Courage To Care - Rescuers of Jews during the Holocaust, NYU Press, 1986, p. 2. Also quoted by Yad Vashem and Nicholas Kristoff in The Silence of the Bystanders, New York Times (March 19, 2006). The opposite of love is not hate, it's indifference. The opposite of art is not ugliness, it's indifference. The opposite of faith is not heresy, it's indifference. And the opposite of life is not death, it's indifference. Because of indifference, one dies before one actually dies. To be in the window and watch people being sent to concentration camps or being attacked in the street and do nothing, that's being dead. From time immemorial, people have talked about peace without achieving it. Do we simply lack enough experience? Though we talk peace, we wage war. Sometimes we even wage war in the name of peace. . . . War may be too much a part of history to be eliminated—ever. An immoral society betrays humanity because it betrays the basis for humanity, which is memory. An immoral society deals with memory as some politicians deal with politics. A moral society is committed to memory: I believe in memory. The Greek word alethia means Truth, Things that cannot be forgotten. I believe in those things that cannot be forgotten and because of that so much in my work deals with memory... What do all my books have in common? A commitment to memory. Close your eyes and listen. Listen to the silent screams of terrified mothers, the prayers of anguished old men and women. Listen to the tears of children. Jewish children, a beautiful little girl among them, with golden hair, whose vulnerable tenderness has never left me. Look and listen as they walk towards dark flames so gigantic that the planet itself seemed in danger. What is abnormal is that I am normal. That I survived the Holocaust and went on to love beautiful girls, to talk, to write, to have toast and tea and live my life — that is what is abnormal. It's up to you now, and we shall help you — that my past does not become your future. When a Jew visits Jerusalem for the first time, it is not the first time; it is a homecoming. The greatest commandment to me in the Bible is not the Ten Commandments. (First of all, it’s too difficult to observe; second, we all pretend to observe.) My commandment is ‘Thou shall not stand idly by.’ Which means, when you witness an injustice: Don’t stand idly by. When you hear of a person or a group being persecuted: Do not stand idly by. When there is something wrong with the community around you or far away: Do not stand idly by. You must intervene. You must interfere. And that is actually the motto of human rights. Commencement ceremony (Class of 2011) at Washington University in St. Louis. "The yellow star? So what? It's not lethal..."
Most people thought we would remain in the ghetto until the end of the war, until the arrival of the Red Army. Afterward everything would be as before. The ghetto was ruled by neither German nor Jew; it was ruled by delusion. No one was praying for the night to pass quickly. The stars were but sparks of the immense conflagration that was consuming us. Were this conflagration to be extinguished one day, nothing would be left in the sky but extinct stars and unseeing eyes. The Hungarian lieutenant went around with a basket and retrieved the last possessions from those who chose not to go on tasting the bitterness of fear. "There are eighty of you in the car," the German officer added. "If anyone goes missing, you will all be shot, like dogs." The beloved objects that we had carried with us from place to place were now left behind in the wagon and, with them, finally, our illusions. "Men to the left! Women to the right!" Eight words spoken quietly, indifferently, without emotion. Eight simple, short words. Yet that was the moment when I left my mother. There was no time to think, and I already felt my father's hand press against mine: we were alone. "The world? The world is not interested in us. Today, everything is possible, even the crematoria..."
"Yisgadal, veyiskadash, shmey raba...May His name be celebrated and sanctified..." whispered my father. For the first time, I felt anger rising within me. Why should I sanctify His name? The Almighty, the eternal and terrible Master of the Universe, chose to be silent. What was there to thank Him for? The absent no longer entered our thoughts. One spoke of them who knows what happened to them? but their fate was not on our minds. We were incapable of thinking. Our senses were numbed, everything was fading into a fog. We no longer clung to anything. The instincts of self-preservation, of self-defense, of pride, had all deserted us. In one terrifying moment of lucidity, I thought of us as damned souls wandering through the void, souls condemned to wander through space until the end of time, seeking redemption, seeking oblivion, without any hope of finding either. The night had passed completely. The morning star shone in the sky. I too had become a different person. The student of Talmud, the child I was, had been consumed by the flames. All that was left was a shape that resembled me. My soul had been invaded - and devoured - by a black flame. "Where He is? This is where hanging here from this gallows..."
Because He caused thousands of children to burn in His mass graves? Because He kept six crematoria working day and night, including Sabbath and the Holy Days? Because in His great might, He had created Auschwitz, Birkenau, Buna, and so many other factories of death? How could I say to Him: Blessed be Thou, Almighty, Master of the Universe, who chose us among all nations to be tortured day and night, to watch as our fathers, our mothers, our brothers end up in the furnaces? But now, I no longer pleaded for anything. I was no longer able to lament. On the contrary, I felt very strong. I was the accuser, God the accused. My eyes had opened and I was alone, terribly alone in a world without God, without man. Without love or mercy. I was nothing but ashes no, but I felt myself to be stronger than this Almighty to whom my life had been bound for so long. In the midst of these men assembled for prayer, I felt like an observer, a stranger. The bell. It was already time to part, to go to bed. The bell regulated everything. It gave me orders and I executed them blindly. I hated that bell. Whenever I happened to dream of a better world, I imagined a universe without a bell. "Don't be deluded. Hitler has made it clear that he will annihilate all Jews before the clock strikes twelve." "What do you care what he said? Would you want us to consider him a prophet?" "I have more faith in Hitler than in anyone else. He alone has kept his promises, all his promises, to the Jewish people." We were outside. The icy wind whipped my face. I was constantly biting my lips so that they wouldn't freeze. All around me, what appeared to be a dance of death. My head was reeling. I was walking through a cemetery. Among the stiffened corpses, there were logs of wood. Not a sound of distress, not a plaintive cry, nothing but mass agony and silence. Nobody asked anyone for help. One died because one had to. No point in making trouble. When I woke up, it was daylight. That is when I remembered that I had a father. During the alert, I had followed the mob, not taking care of him. I knew he was running out of strength, close to death, and yet had abandoned him. Yet at the same time a thought crept into my mind: If only I didn't find him! If only I were relieved of this responsibility, I could use all my strength to fight for my own survival, to take care of myself...Instantly, I felt ashamed, ashamed of myself forever. His last word had been my name. He had called out to me and I had not answered. I did not weep, and it pained me that I could not weep. But I was out of tears. And deep inside me, if I could have searched the recesses of my feeble conscience, I might have found something like: Free at last! BERISH: I resigned from membership in God—I resigned from God. Let Him look for another innkeeper, let Him find another people, let Him push around another Jew—I’m through with Him! MARIA: Don’t you worry, Master. You say things, but God isn’t angry How could He be? He isn’t even listening. PRIEST: Are you taking their side, daughter? You’ll burn in hell. MARIA: Better in hell with them than in paradise with you. MENDEL: What shall we play? MENDEL: Of course; it’s your theater. MARIA: Long live theater...What’s theater? BERISH: When you do something without doing it, when you say something without saying it, while thinking that you did say, and you did do something—anything—that’s theater. BERISH: I distrust miracles. They exist only in books, and books say anything. BERISH: Men and women are being beaten, tortured and killed—how can one not be afraid of Him? True, they are victims of men. But the killers kill in His name. Not all? True, but numbers are unimportant. Let one killer kill for His glory, and He is guilty. Every man who suffers or causes suffering, every woman who is raped, every child who is tormented implicates Him. What, you need more? A hundred or a thousand? Listen: either He is responsible or He is not. If He is let’s judge Him; if He is not, let Him stop judging us. BERISH: Prosecutor. That’s what I am going to be. Prosecutor. AVREMEL: That’s someone nice who has the right to be nasty. MENDEL: Right. Under one condition: that they do not say it. SAM: Isn’t this a circus...of sorts? MENDEL: No. It’s theater. There is a difference. SAM: Really? What is it? MENDEL: A circus employs only clowns. SAM: So does the theater. AVREMEL: You came to us from Zhironov? MENDEL: Yes, I was there. AVREMEL: How did you manage to escape? SAM: There is always one singled out to escape. SAM: There is always someone to call it a miracle. Wherever men and women are persecuted because of their race, religion, or political views, that place must at that moment become the center of the universe. As long as one dissident is in prison, our freedom will not be true. As long as one child is hungry, our lives will be filled with anguish and shame. What all these victims need above all is to know that they are not alone; that we are not forgetting them, that when their voices are stifled we shall lend them ours, that while their freedom depends on ours, the quality of our freedom depends on theirs." Language failed us. We would have to invent a new vocabulary, for our own words were inadequate, anemic. It seemed as impossible to conceive of Auschwitz with God as to conceive of Auschwitz without God. Therefore, everything had to be reassessed because everything had changed. With one stroke, mankind's achievements seemed to have been erased. Was Auschwitz a consequence or an aberration of "civilization"? All we know is that Auschwitz called that civilization into question as it called into question everything that had preceded Auschwitz. Scientific abstraction, social and economic contention, nationalism, xenophobia, religious fanaticism, racism, mass hysteria. 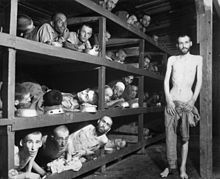 All found their ultimate expression in Auschwitz. Of course some wars may have been necessary or inevitable, but none was ever regarded as holy. For us, a holy war is a contradiction in terms. War dehumanizes, war diminishes, war debases all those who wage it. The Talmud says, "Talmidei hukhamim marbin shalom baolam" (It is the wise men who will bring about peace). Perhaps, because wise men remember best. After the war we reassured ourselves that it would be enough to relate a single night in Treblinka, to tell of the cruelty, the senselessness of murder, and the outrage born of indifference: it would be enough to find the right word and the propitious moment to say it, to shake humanity out of its indifference and keep the torturer from torturing ever again. We thought it would be enough to tell of the tidal wave of hatred which broke over the Jewish people for men everywhere to decide once and for all to put an end to hatred of anyone who is "different" — whether black or white, Jew or Arab, Christian or Moslem — anyone whose orientation differs politically, philosophically, sexually. We tried. It was not easy. At first, because of the language; language failed us. We would have to invent a new vocabulary, for our own words were inadequate, anemic. And then too, the people around us refused to listen; and even those who listened refused to believe; and even those who believed could not comprehend. Of course they could not. Nobody could. The experience of the camps defies comprehension. If someone had told us in 1945 that in our lifetime religious wars would rage on virtually every continent, that thousands of children would once again be dying of starvation, we would not have believed it. Or that racism and fanaticism would flourish once again, we would not have believed it. Terrorism must be outlawed by all civilized nations — not explained or rationalized, but fought and eradicated. Nothing can, nothing will justify the murder of innocent people and helpless children. They are committing the greatest indignity human beings can inflict on one another: telling people who have suffered excruciating pain and loss that their pain and loss were illusions. Robert McAfee Brown. Preface for the 25th anniversary edition of Night. Page v, Bantam Books paperback; 1982 reissue edition. 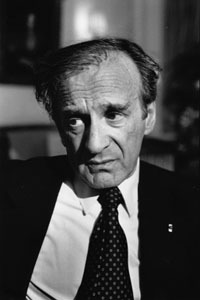 It is the Committee's opinion that Elie Wiesel has emerged as one of the most important spiritual leaders and guides in an age when violence, repression and racism continue to characterise the world. Wiesel is a messenger to mankind; his message is one of peace, atonement and human dignity. His belief that the forces fighting evil in the world can be victorious is a hard-won belief. His message is based on his own personal experience of total humiliation and of the utter contempt for humanity shown in Hitler's death camps. The message is in the form of a testimony, repeated and deepened through the works of a great author.